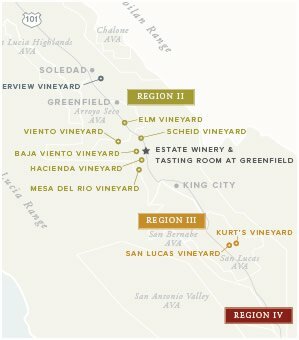 In the sub-appellation of San Lucas, located 12 miles south of King City, lies our San Lucas Vineyard, comprised of approximately 875 acres. San Lucas Vineyard is a postcard-perfect vineyard, with a softly rolling topography and beautiful vistas. 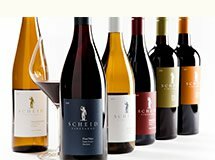 Scheid Vineyards first planted wine grapes in San Lucas in 1979 and, besides being one of the most beautiful vineyards on the Central Coast, this high caliber site consistently produces outstanding fruit year after year. The warm days followed by cool winds from the Monterey Bay in the late afternoon present excellent climatic conditions for growing top quality wine grapes. Located on the southwestern edge of the Salinas Valley, the San Lucas AVA is comprised of sweeping alluvial fans and terraces. Since the mid-1800’s, this land was primarily used as an open range for cattle grazing. It wasn’t until 1970 that the first grapevines were planted and we followed just nine years later with our eponymous San Lucas Vineyard. Contrasted with our vineyards to the north, San Lucas experiences a warmer overall climate during the daytime, although morning fogs are still quite common. Temperatures often fluctuate as much as 40 degrees from day to night during the summer. This temperature swing is a major factor resulting in the longer growing season, giving the fruit time to develop full body and flavor. The soil of San Lucas is composed of diatomaceous shale and various sizes of sandstone. These well-drained, looser soils allow for deep root penetration of 60 inches or more. We grow a spectrum of varieties on San Lucas Vineyard, 14 in all, a testament to the ideal conditions present at this site. Chardonnay from this location is known for its bright, tropical fruit flavors. Sauvignon Blanc is brighter and fruitier than the fruit from the Greenfield area, which has more citrus, grassiness and a mineral edge. The sunshine-filled days at San Lucas are ideal for Cabernet Sauvignon, which needs a good dose of warmth to reach its full flavor potential, while the cooling maritime influence in the late afternoons keeps the vines in check and maintains the acidity that is so crucial to fine wine. Merlot from San Lucas, as contrasted with the Merlot from the cool climate of Greenfield, is fruitier and lusher, with big cherry flavors and a softer palate. 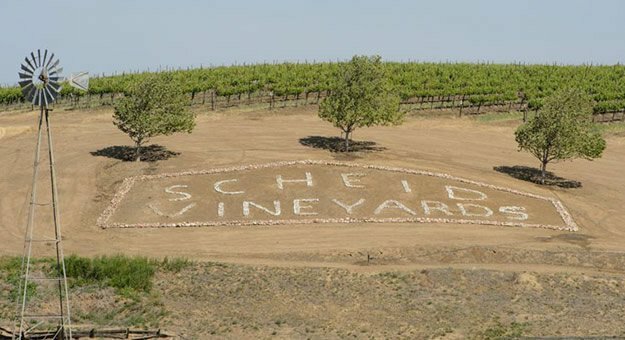 San Lucas Vineyard is the home of our Rhône varietals, as the climate is similar to the Rhône region of France. Blustery afternoon winds, known as the mistral in France, are ever-present in the Salinas Valley and San Lucas has similar degree days to the Rhône region. Grenache, Syrah, Cinsault, Grenache Blanc, Muscat Canelli, and Viognier all find their home at our San Lucas Vineyard, producing highly aromatic wines that are bursting with fruit.